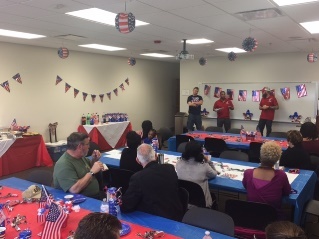 South University, Novi recently hosted a Military Appreciation Luncheon to honor its student veterans. Student veterans were thanked for their service by the campus president, and the luncheon included a presentation by two members of the Team Read, White & Blue organization. Team Red, White and Blue gave student veterans information about the resources available to them around the Novi area. The organization’s mission is to encourage veterans to become active in their communities through a variety of opportunities. Programs, credential levels, technology, and scheduling options vary by school and are subject to change. Not all online programs are available to residents of all U.S. states. South University, Novi 41555 Twelve Mile Road Novi, MI 48377 © 2017 South University. All rights reserved. Our email address is materialsreview@southuniversity.edu.